If you're looking to have your excavation project handled by a profesional, Then you've come to the right place. Give us a call to see how we can help you. If you are looking for the best rock walls in Portland, you have come to the right place. 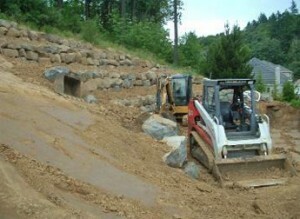 At The Excavators, LLC, we have been providing customers with the best rock walls in the industry for many years. As the area’s most reliable Rock Wall Contractor, we place customer satisfaction as our number one priority and although our typical high quality rock walls are less than four feet high, we can engineer any rock wall for our customer’s various needs. Why You Should Hire Us For Your Rock Wall in Portland, Or. We have all the equipment necessary to get the job done right. We will travel to meet your needs, serving customers in and around the Portland Metro area. As a family owned and operated contracting company, we have a true concern for each customer. We take pride in our work, as if it were in our own yard. Rock walls offer more stability to sloped yards. A rock wall can add a beautiful back drop to a garden or yard. Rock walls act as preventative care against erosion on sloped areas. Various rock walls in a row can differentiate garden plots. Your landscaping can remain beautiful all year round, even after the plants have died. Getting Started on your Rock Wall in Portland, Or. Whether you already know what you want in a rock wall, or if you are looking for some advice from the professionals, contact The Excavators, LLC. With three generations in the business, we truly have the experience and knowledge that it takes to get your rock walls in Portland looking just how you want them to. The Excavators, LLC also specialize in sewer repair and directional drilling in Portland. Contact us today at 503.869.0910 to get started on your project, or simply to have some of your questions answered. We partner with several plumbers. Among them is American Plumbing Services.